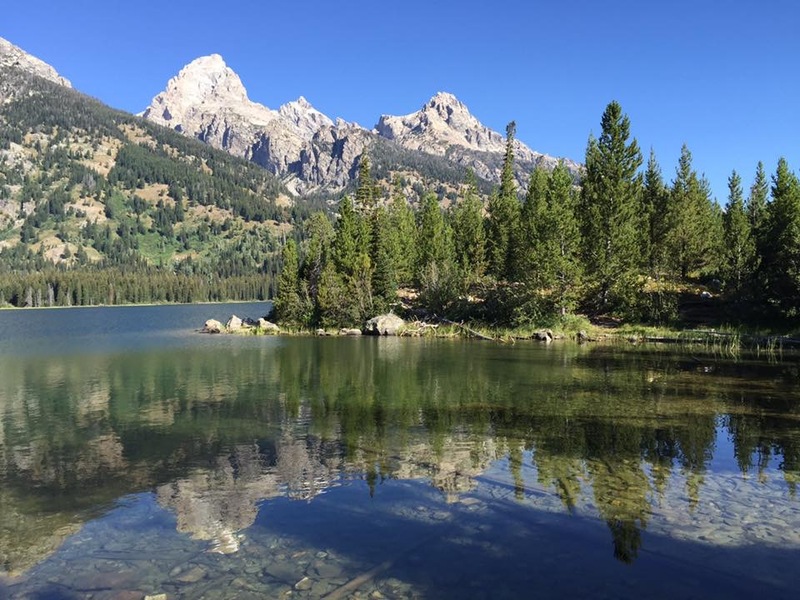 …for the summer in the Grand Tetons. After several months of relaxing, it is time to get back to work! We are both ready to go for the summer. Before I get into our summer jobs, I will do a little catching up, since it has been 2 months since I last posted. Now that we are back to work, I promise to update the blog more. We left Florida at the end of March, when it had started to get hot and humid, and made a bee-line to Elkhart, Indiana to have some routine maintenance work done on the fifth wheel. Tiara RV was able to squeeze us in, and we would recommend them for service on fifth wheels and travel trailers if you are ever in the area. Our next stop was “Camp Meyer” (Dan’s sister and brother-in-laws house). It’s Makena’s favorite “campground” and once again she was very excited when we let her out of the truck. We parked there for about 5 weeks, while visiting friends/family and taking care of routine medical/dental visits and truck maintenance. As usual, there is never enough time to visit with everyone, and we hope to see those we missed this fall. Several trips were made to Oconto Falls, to visit Dan’s parents. His dad has made remarkable progress in his recovery from guillain-barré syndrome. Dan was able to take him out golfing, and Makena convinced the ‘grandparents’ that she needed to walk and play multiple times every day. Grandparents are such easy targets! We also played many games of ‘hand and foot’, and provided some iPad ‘tech support’. We had a few nice visits down in the Milwaukee area with friends and family, in between our appointments. Our good friends Dave and Angie had us over for an excellent BBQ, and Mike and Karlyn took us out for a fun night on the town. We also had a delicious Cinco de Mayo dinner with college friends Robin and Mary (forgot to bring the camera). My brother Brian, and sister-in-law Annette had us over for a visit, and we were able to take advantage of some nice weather to get in a short hike in the Kettle Moraine Forest, along with a climb to the top of the fire tower. We stayed at my sister Margie and brother-in-law Greg’s house for a few days, and had a nice time catching up with them, as they are temporary ’empty nesters’ with my nieces both away at college. Dan and Greg snuck out for a local beer tasting, and seemed to have a good time! I was also able to get together for my annual “patio beer” with a former co-worker, Amy. It’s always nice to catch up with family and friends, but we had only a limited amount of time, before beginning our journey west. First stop: Des Moines, Iowa. We were able to attend the Drake University College of Pharmacy Hooding Ceremony. After 6 years, Jasmine received her Doctor of Pharmacy degree, along with about 105 other students in the program. During the ceremony, her father Gary (Dan’s brother) leaned over towards me and said “We now have a Dr. J in the family!” I think he’s been waiting 6 years to say that!! I’m not sure what he was happier about: the fact Jasmine is now a doctor, or the fact that he no longer has anymore college tuition to pay for, as all three daughters are finished with school! While we were in Des Moines, we were able to meet up with fellow RV’er Linda Clayton for dinner. She will be workcamping for the summer at a campground in northern Wisconsin. It was nice to catch up with a fellow Amazonian! I don’t take selfies, so the picture is not very good! When Linda and I were both Picking together at Amazon, people insisted we were sisters. We left Iowa and continued West through Nebraska and up into Wyoming towards Grand Teton National Park. We will be spending the summer at Luton’s Teton Cabins in Moran, WY. I will do a separate post in a week or two on our specific jobs and perks. If you want to see what the cabins look like, or follow along on a live web cam of the Grand Tetons, you can click on the link above. We found this job courtesy of our friends Karen and Al, whom we will be working with this summer. We have not been doing too much exploring yet, as I have been battling a bad cold, and the weather has been a bit chilly (27 degrees this morning!). Today it alternated between sunshine and snow flurries which is typical Spring weather for Wyoming! Our drive into the Tetons was interesting. Nothing like a snowstorm in late May! I did manage to plant some basil, cilantro and a container tomato plant. They were outside for 2 days, and have been sitting inside the RV the past couple of days. It should warm up next week, so hopefully they will start perking up a bit with some sunshine. The big pot was a gift from our former neighbors, The Kierzek’s. They have four wonderful kids, and they used their thumb and finger prints to create designs on the pot. Thanks again Adam, Faith, Josh and Ben!! (and Kyle and Jolie too!) Hopefully with all the love that went into the pot, it will help produce some good tomatoes this summer! Stay tuned, more frequent blog posts to follow! And as always, thank you for following along on our adventures!